In a world of contracting markets and diminished consumer demand, The Cambridge Group founder Rick Kash and Nielsen Company CEO David Calhoun show companies how to find new customers and bigger profits. 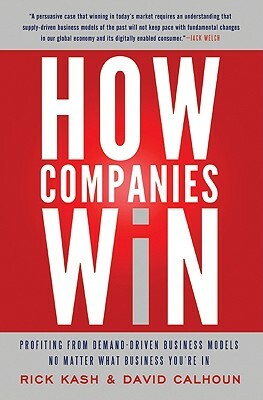 How Companies Win makes The Cambridge Group’s proprietary demand model—a strategy which multi-million dollar corporations pay premium rates to access—available to the general public for the first time. Taking the reigns from Larry Bossidy’s Execution, W. Chan Kim and Renée Mauborgne’s Blue Ocean Strategy, and Kash’s own The New Law of Demand and Supply, this is a must-have for succeeding in business in the twenty-first century. Rick Kash is the founder and CEO of The Cambridge Group, the growth-strategy consulting firm. He is also the author of The New Law of Demand and Supply. Kash works with companies around the world to help them grow through demand-based business models. David Calhoun has been the chairman of the executive board and CEO of The Nielsen Company since 2006. Calhoun has previously served as the vice chairman of the General Electric Company, the president and chief executive officer of GE Infrastructure, and the chief executive of several other GE divisions and subsidiaries.